Beef up your Mallory magneto drive! The old 4-pin drive and "rubber biscuit" coupling in Mallory magnetos is a source of irritation for our customers. Besides cracking and breaking prematurely, they cause ignition timing to be erratic and retard as much as 6-8 degrees! The rubber twists up and unwinds at idle and makes the timing mark jump all over the place, especially with the higher powered Mallory mags. Replacing the rubber "advance lockout" every couple of years helps reliability, however the simple molded piece of rubber is absurdly expensive for what it is. With the old rubber drive diamond, you must build in an extra 6-8 degrees of static timing in order to get the timing you want at high engine speeds. Timing is not consistent through the RPM range. As a result, using this adapter and setting static timing where it belongs may help your motor start easier. Install the strong, stable "cross" on the bottom of your mag and drop our Mallory-to-Cross adapter into your Mallory lower drive. It fits right over the two drive pins in the base and provides the female cross receptacle that your mag will fit right into. Rock solid and stable for Mallory Sprint mags and Super Mags all the way up through the big Super Mag 5 monsters. The timing problem is especially bad when using a PSI rev limiter with the Mallory drive, as the PSI drive adapters only have two pins. Two pins in the rubber (instead of four) makes things flex and move even more. 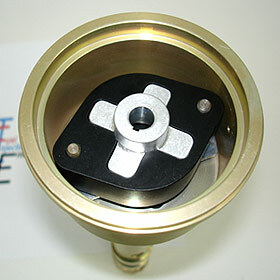 Now, you can use the cross drive adapter with your PSI in your Mallory lower drive and be completely stable. You can also use this setup to couple an MSD magneto to a Mallory lower drive. The Pro Mag 12 and 20 are fine with this. The two pins in the Mallory drive are NOT strong enough for the Pro Mag 44 however! 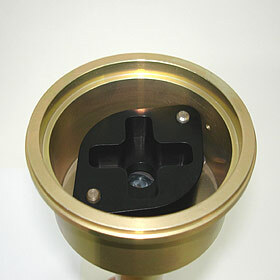 All aluminum construction, the coupler is hard anodized for years and years of service. Sold together as a pair and includes new nylock nut, stainless washer and key. 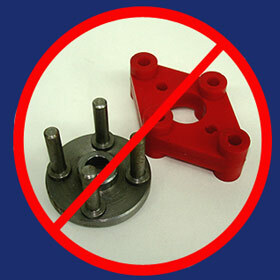 Stop buying "rubber biscuits" and get the solid solution!